It’s another breakfast lesson this week! I made Huevos Rancheros this morning, and before today I didn’t even know what Huevos Rancheros was, so I’m putting that in the “what I learned” bucket for sure. And, I had never cooked or eaten a sunny-side-up egg before. I found the recipe at Annie’s Eats. She has a ton of yummy-looking recipes I’d like to make! I followed the directions in the original recipe, except I didn’t want to use my new food processor because Chris was still sleeping and I wasn’t sure how loud it would be. I decided to use my hand blender instead, and that worked just fine since it was just mixing beans and spices. Oh and I didn’t have a heavy cast iron skillet to heat the tortillas, so I just used a regular skillet. I also copied Annie’s food presentation almost exactly because I have no idea what this usually looks like. 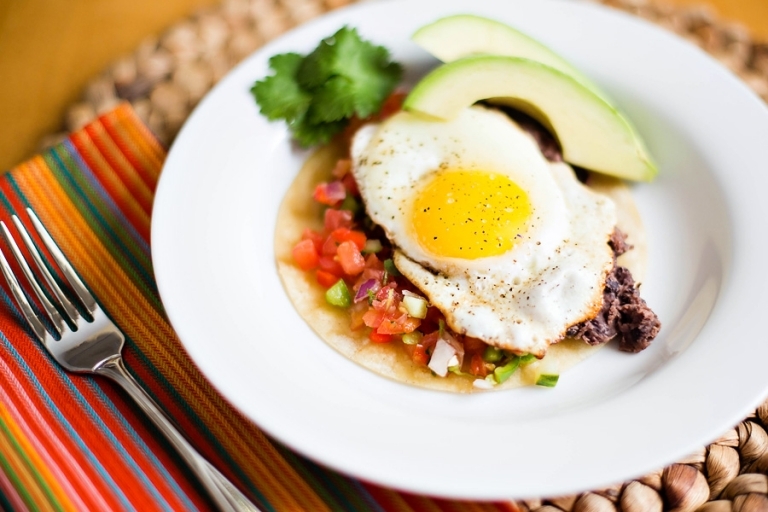 What I learned: I learned what Huevos Rancheros is, and I learned that sometimes it’s totally fine to use another appliance instead of what the recipe calls for – a hand blender instead of a food processor, for instance. What went well:It was delicious! What I can do better next time: I made a huge mess. Maybe I can work on cleaning as I go?! In the bowl of a food processor, combine 1½ cups of the black beans, lime juice, cumin, cayenne, and salt. Process until smooth. If necessary, add broth 1 tablespoon at a time to achieve an even consistency. (Alternative method: you can use a hand blender to process the beans, spices and lime juice.) Transfer the mixture to a bowl or saucepan and mix in the remaining 1½ cups of beans. Set aside. In a skillet, melt ½ tablespoon of the butter over high heat. One at a time, add the first three tortillas to the skillet, flipping once, until slightly charred on both sides. Transfer to a plate. Melt an additional ½ tablespoon of butter and brown the remaining tortillas. Set aside. In a large non-stick skillet, melt the remaining 1 tablespoon of butter over medium heat. Gently crack the eggs into the pan. Season with salt and pepper and let cook until the white is fully cooked through but the yolk is still soft. (Cook eggs in batches if necessary.) Meanwhile, heat the bean mixture until warmed through either in the microwave or on the stove. Place each tortilla on a plate. Spoon some of the bean mixture over the top and sprinkle with shredded cheese. Top each tortilla with a cooked egg. Top with salsa, sour cream, hot sauce, and avocado as desired. Garnish with cilantro. They share some great recipes for Northern New Mexico cooking too!